Do you object to the battlefield being developed? Please don’t leave it to others as every single one of your objections count. The clock is ticking. How to object follows our statement. This is our statement regarding the recent planning application to build a car park and other works on the 1460 registered battlefield. The retrospective planning application states categorically that the ‘finds’ discovered on this site are of “no importance”, this could not be further from truth; a medieval broach, and potentially significant finds of round shot that could revise the understanding of the early use of handguns in England are detailed in MOLA’s report. The one sided nature of this conclusion raises questions about the integrity of the applicants and their future intensions for this site. It is essential that the whole battlefield be archaeologically investigated before any steps to develop the site damage this crucial historical environment. 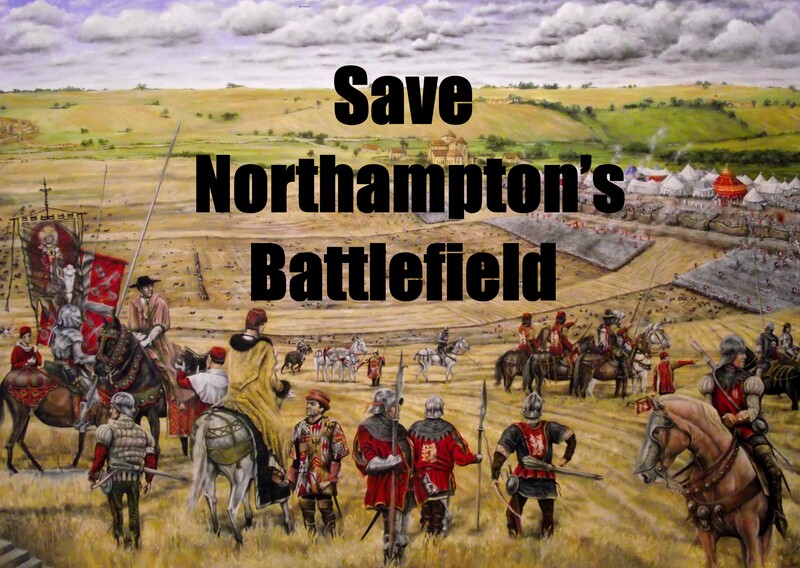 It is therefore the responsibility and duty of the Northampton Battlefield Society to call upon the Northampton Borough Council to reject the retrospective planning application for a Car Park outright, and to work with the Society to ensure the future protection of this historical battlefield. The Planning Application by Delapre Golf Club provides Northampton Borough Council (NBC) with a real opportunity to partly restore through their actions, their reputation for protecting and preserving our local heritage. Here is a chance for them to refute the public’s perception of their apparent lack of care, recently observed during the controversy over museum sales portrayed in the international media. NBC can achieve this improvement of their standing by not only refusing this planning application for a car park, but also by publicly resolving to put themselves behind the full protection of the whole area of this nationally important battlefield for the local community and future generations to enjoy. go to the on-line Planning Portal http://www.northampton.gov.uk/…/…/view_planning_applications click the search for a planning application button, on the new screen, enter the reference number N/2015/0785, click search. When details of the application appear, click the red comment button and you will be able to register your objection. I would have thought that King Richard had had enough of car parks! Visited Leicester Cathedral last Autumn and both my wife and me thought that it was a great memorial for him-my wife particularly admired the embroidery and one could recognise the people involved!